We have just released the new Mission Game in Eleka's Castle. The Fates are three evil Maradan goddesses who control the fate of every mortal and immortal marapet, from their birth to their death. The fates are willing to put you to the test, by giving you an evil mission for either Cooking Ingredients, Voodoo Dolls or Poision items. They have 30 different missions for you, each harder than the last. You will need to find items and bring them back to them. If you fail to bring any of them, you will have to start again and they will also punish you and your pets! Completing this mission will get you a limited edition Yuni pet! Can you find these two Avatars? The final stage of the War is now on. 75,000 from each side is now attacking. This will be your last chance to get War Points, when these are gone, the war will be over, so we can finally move onto some of the great new events we have planned for the summer. Once the war has ended, the War Redemption shop will restock a few more times for you to spend the rest of your war points. These two new Camouflage Pets have been added just in time for the final stage of the war! The Crindol is now avaliable in Prison, Mutant and Zombie colours! Can you find the Poison and Murderer avatars? We have two new DNA Minipets, which mean you can now get a mutant Viotto, Crindol and Lati! Introducing the Viondol and the Chati! We have just added the Eleka Fountain to Eleka's Castle map. One of your pets can visit the fountain every 5 hours, throw in 50RP and see what happens! The fountain was enchanted with the magic of Queen Eleka, so your pet may gain some magic stats from the fountain! But as Eleka is evil, the pet may just get really unhappy and sick. The Eleka Fountain and One in a Million game have been added to the Countdown. Can you find the Eleka Fountain avatar we have just hidden? There is a new Monthly Checklist for June! This one will definately be announced in July, when a new checklist will be released. If you want to be in with the chance to win $1,000 worth of prizes - enter for free today! The December winners have also been announced and the prizes have been sent out. You can see all previous Prize Winners listed on the Checklist page - which means its now possible to get the Prize Winner Avatar! The Lottery has been drawn for this week. cheyjade is the winner of the 847,200MP Jackpot with the winning numbers of 2, 13, 6, 25, 5 and 11! Congratulations! Last Week's Raffle has now ended. seashellzx is the winner of the Red DNA and 100,000MP prize with the winning raffle ticket number 21517! Congratulations! Make sure you buy your tickets for today's raffle - only 10MP per ticket! Its June now and this month will be a great month for Marapets. Now that our maintenance has been completed, the site will be quickly returning to normal. We have been busy the past couple of weeks going through the whole site recoding, fixing and tidying up every section of the site and we should be finished in a couple of days with most known glitches. By the end of June, we hope to have returned to our exciting daily news again, have everything thats currently broken fixed - including Marasites/MaraUploads, everything unfinished finished - including the war, monthtly checklist, etc and we also plan to have tons of new features released this month. Thanks for your patience with our long, boring maintenance work we have been having the past few months, but now is when we can start to gain the benefits from it! We have a brand new Flash Game for you to play. Plasma Wars has been added to the Shooting Games category of the games section. Those who have received their Email Newsletters already can now claim their prize at the Vault! 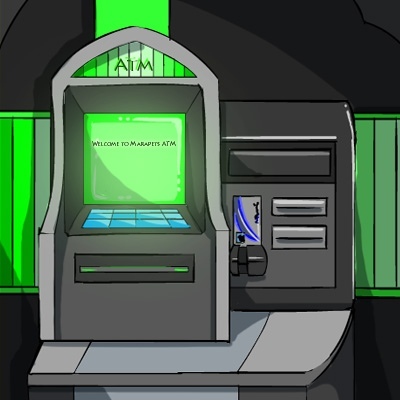 We have redrawn the ATM in Ziranek too! The Lottery has been drawn for this week. babyrudisel1230 is the winner of the 620,900MP Jackpot with the winning numbers of 3, 5, 6, 8, 10 and 9! Congratulations! Last Week's Raffle has now ended. mychemicalfreak is the winner of the Red DNA and 100,000MP prize with the winning raffle ticket number 30906! Congratulations! Make sure you buy your tickets for today's raffle - only 10MP per ticket! We have just updated Eleka's Castle map with tons of new places that are coming out soon! We have a brand new Flash Game for you to play. Gumball Machine Madness has been added to the Strategy Games category of the games section. We hope you all like this game as much as we do! We hope you all enjoyed our National Maradan Holiday yesterday. The server Newths went on strike and caused chaos on the site! And if you don't believe that, sorry for the problems we had for a few hours yesterday, we were upgrading some of our servers a month ahead of schedule and didn't have enough time to prepare & warn you about it! Five new Renat colours are now avaliable. We have a new shop in Eleka Castle for you to restock! This evil shop sells Cooking Ingredients which are in fact parts of pets! This is also the first non-MP restocking shop, as this shop sells items for RP! This is what the new prison, mutant and zombie Renat look like! A new Editorial has just been released. A new Email Newsletter is currently being sent out. Inside is a vault code which can be used in a couple of days to earn a new item, MP and account upgrade credit. Please note that it will take up to 3 weeks for everyones email to be sent, so please be patient. You may also want to check your spam folder and/or allow emails from marapets@gmail.com to make sure you receive it. We have just added the new Rainbow Tantua and a Burnt Yakubi. We have just added the new Rainbow Viotto and a Plushie Grint. The Clubs had lots of upgrades and bug fixes yesterday. All of the problems you had with clubs before should be fixed now, and we have also upgraded the clubs servers so they should run even faster for you now. Can you find this Devil Avatar? The Lottery has been drawn for this week. maryjane1959 is the winner of the 642,500MP Jackpot with the winning numbers of 15, 6, 18, 25, 4 and 1! Congratulations! Last Week's Raffle has now ended. bimbaallo12 is the winner of the Red DNA and 100,000MP prize with the winning raffle ticket number 5897! Congratulations! Make sure you buy your tickets for today's raffle - only 10MP per ticket! A Toddler Chibs Potion or a Toddler Reese Potion and a Toddler Costume are all part of the upgrade. The new Toddler Costume is avaliable on three pets already.. Your characters can also be part of the Chibs craze with these Chibs Character costumes. There is also a cute new minipet, cd, pearl and dvd! We have a brand new Flash Game for you to play. Dagger Throw has been added to the Sports category of the games section. We hope you all like this game as much as we do! We would also like to let you know that the May Account Upgrades are being released tomorrow, and will have a new Chibs potion.. a Toddler Costume! Today is your FINAL chance to get a September upgrade - Sindi's will not be back in the upgrades for another 6-9 months! When the site's layout was redrawn a few weeks ago, you all noticed a few extra links added and wondered what they were for. The Pets link on the side bar has now been released as a new section, which is almost everything to do with pets. Pets link at the top is now the pets you already have. We hope you find that this new section makes the site a lot easier to navigate - we will be doing the same to the dress up characters, shopping and the currency page. We have added two more prizes to the Loyalty Programme. Are you an Avatar Freak?? The Lottery has been drawn for this week. snowyman101 is the winner of the 643,600MP Jackpot with the winning numbers of 17, 4, 14, 21, 7 and 11! Congratulations! Last Week's Raffle has now ended. berentdonato is the winner of the Red DNA and 100,000MP prize with the winning raffle ticket number 318! Congratulations! Make sure you buy your tickets for today's raffle - only 10MP per ticket! We have just released King Baspinar's Loyalty Programme in Baspinar's Castle! This new feature rewards members for their loyalty, by giving them a new prize for every month that they have been playing! You get your first prize after 5 days of being on the site. Rememeber that it is one account per person, and we are heavily logging all activity for this feature, so cheaters will be automatically banned from the site when caught. You can go inside the castle now to see the full list of rewards! We have a brand new Flash Game for you to play. Newth Snowboarding has been added to the Strategy category of the games section. Now that the site is back to normal, for aslong as we have the support of Account Upgraders, we will be releasing a new game every week! We have also fixed Pearl Skipping flash game so that it sends score properly! Can you find this Eleka avatar? Now that Account Upgrades are back and working as they should be, we have decided it was time to fix the old Marasite & Journal upgrade items which are no longer avaliable. These items are now limited edition items on sale at the Account Upgrades page until further notice. If and when we do re-release the Marasite & Journal upgrades, these items will not be part of it anymore, so this may be your last chance to get them. The May Account Upgrades are currently being worked on and should be released next week, along with the new mission. This means that you only have a few more days to get the September Account Upgrade before it retires, and the November upgrade changes from £8 to £10. This is how the Yuni will look as a mutant, prison or as a zombie! We have finished our work on the Account Upgrades system and if you haven't already noticed, there has been a lot of changes. We have changed from US dollars to UK Pounds because we are a UK website and its easier and cheaper for us to us UK Pounds. We have also changed to Google Checkout! You can make an account there in 2 quick and very easy stages which will take only a few minutes and then buying Account Upgrades will be much easier than it was with Paypal. We have currently disabled Paypal payments for improvements. However, when Paypal returns, you will not get the 20% extra credit you receive with Google Checkout. Paypal is also a lot slower to process than Google, so we hope you will choose Google Checkout instead, because it is much much better in our opinion! With every Google Checkout payment you make, you will receive 20% extra credit FREE until Sep 07! Also, get a free Billy minipet with your first ever purchase with Google Checkout! We have been going through major maintenance and upgrades to the site for nearly 8 months now and today we have finally finished. We would like to say a huge thank you to all of you that have continued to stayed with us through all of the lag, downtime and random server errors and glitches and to all of the account upgraders that have helped us to pay for it all! We are hoping that by the end of this month, every known glitch on our list is fixed, including Marasites, and we will also be contiuning to revamp, reorganise and improve all of the major sections of the site. Then in June, we will be back to normal with tons of great new updates, including new flash games, pets, worlds, items and lots of other things we are going to keep secret! The Fasoro has finally been revamped. We will be revamping a few more pets soon, but the Fasoro was one of the only pets that hasn't changed since we first opened and is becoming more and more difficult to do new and interesting costumes for. We hope you like the change, and if not, theres 40 other pets to choose from! Can you find this Light Hidden Avatar?